TEACH CHILDREN HOW TO BE SAFE! There are almost as many guns in the U.S. as there are people! Police carry guns to keep order and ensure public safety. The Military has guns to defend our country. Criminals carry guns to intimidate people and to commit crimes. EVERY PARENT SHOULD KNOW about gun safety. Even if you do not own a gun, many others, including neighbors, friends and relatives may have guns. Guns are powerful. Even the smallest handgun can cause severe injury or death. Children must UNDERSTAND and FOLLOW safety rules. Children must learn how to steer clear of danger. Shootings can be avoided. Gun related injuries are the 2nd leading cause of death among young people over the age of 10. Many gun injuries occur in homes and involve people who know each other. 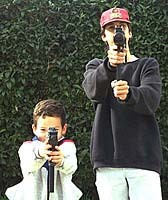 Victims are often children playing with guns who assume they aren’t loaded. Everyone should assume all guns are loaded and ready to fire. Statistically, injury or death by gunshot is more likely in homes where guns are present. Children are naturally curious, they love to explore and experiment. Assume your children know where any "secret hiding places" are in the homes where they live, play and visit. Guns are familiar and attractive to children. They see plenty of guns on TV, in movies and in video games. Some children can not tell the difference between real guns and fake ones. Locked in a gun safe or strongbox or other secured container. (Carry the key with you or keep it in a secure place). Stored separately from ammunition (which is locked away). Out of sight and reach of children. GUNS THAT CANNOT BE LOCKED AWAY SHOULD BE STORED UNLOADED WITH A TRIGGER LOCK IN PLACE. Have received safety training from a qualified instructor. Only do so under adult supervision. OBEY ALL GUN LAWS State laws vary widely. Know the specific laws in your area. Purchase and transfer of firearms. Permanent disability (life in a wheelchair, for example). TELEVISION VIOLENCE IS NOT REAL. Explain media entertainment is pretend. Discuss the fact that actors walk away after a scene involving guns and shooting. People in real life do not. Never touch any gun or bullets. They are not toys. They are not to be touched in any way. Assume all guns are loaded and ready to fire. Leave at once if a gun or bullets are present. If your children see a gun at home, at a friend's or relative's house or school, tell them to get away fast. Go to the nearest safe place, another room, another home, a familiar business, etc. Tell an adult. Tell a parent, teacher, law enforcement officer or other adult right away. Constructive conflict resolution - Children need skills to handle problems, peer pressure and disagreements without violence. Mediation - This is a form of conflict resolution that involves the help of a third party. Anti-violence programs - Encourage your child to participate in community and school based programs. Be alert for signs of depression. Set an example by doing the same. Feelings that are bottled up inside. Withdrawal from friends and activities. Loss of appetite or large increase in Appetite. Headaches, stomachaches and other Physical problems. Any person showing these signs for more than a few days needs help. Get help immediately if your child has thoughts of suicide. Discuss the dangers of alcohol and other drug use. Set a strict no-use policy. Be a positive role model. Never abuse alcohol or use illegal drugs yourself. Agree to pick up your child if he or she is in a situation where alcohol or other drugs are being used.